Huntington Harbour Village--a great 55+Community! This lovely triple-wide home offers charm and character throughout and is just approx. 2 miles from the beach. 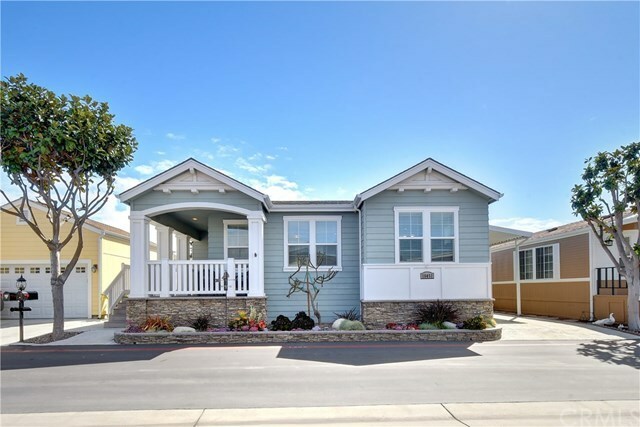 Huntington Harbour Village is the only manufactured home community in Huntington Beach where residents own the land--no space rent and low dues. A Community Clubhouse boasts a "caterers delight" kitchen, heated community saltwater pool, spa, sauna, exercise room, putting green, BBQ area, and pool table/game room. A second clubhouse includes a card room with an outside fire pit for small group entertaining. There is also RV storage on-site for a rental fee.The community rules state one person residing in the home must be 55 or older and the other can be no younger than 45 years of age. (per HOA's written rules). It is zoned Condo and is one of the largest plans 1969 sq. ft. (per sales docs).This recently built home offers 2 master suites plus another bedroom and 3 baths, dual pane windows, recessed lights throughout including bedrooms. The home includes air conditioning, forced air heating. The kitchen includes stainless appliances, granite counter-tops, plenty of cabinet space, and a breakfast bar. The living room offers plenty of natural light with large windows, newer carpet & Premium Vinyl flooring A laundry room is included. Profession Landscaping. If you have not experienced "The Village", take a look at this wonderful home and see the relaxed lifestyle that this community offers!